Because I Said Sew! 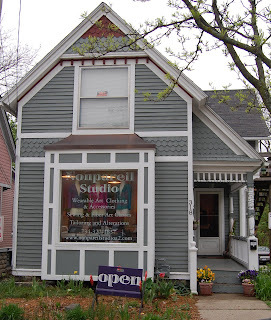 : Nonpareil Studio is Expanding! Nonpareil is thrilled to be taking over the second floor of the vintage home where we are located, which will be used exclusively for sewing and other fiber art classes. A full schedule of classes will be offered along with some new additions. There will be permanent counter-height cutting tables, room for eight sewing stations, and hopefully, a dyeing studio. Stay tuned for further updates!